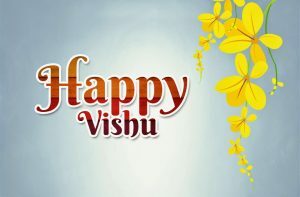 Vishu is a festival celebrated in Kerala, India, which signifies the New Year Day of Malayalam Calendar Kollavarsham or Kollam Era. It is celebrated on the first day of the month Medam which usually falls on 14th or 15th of April. Vishu festival in 2019 comes on Mon, 15th April. The festival has deep cultural significances and the Malayali Hindus around the world celebrate it with passion and devotion. It is being observed also in Mangalore and Udupi districts of Karnataka state, in the second week of April and is called as Bisu. Vishu signifies the Sun’s transit into first zodiac ‘Meda Raasi’ (Mesha or Aries) and is the astrological New Year day for people of Kerala. It also coincides with spring equinox in which the sun crosses the equator, heading northward. An equinox is noted for the equal number of hours of daylight and darkness which describes the origin of the word ‘Vishu’ which in Sanskrit means ‘equal’. When sun crosses the equator it is the first day of Malayalam month Medam and is often confused with Solar New Year. 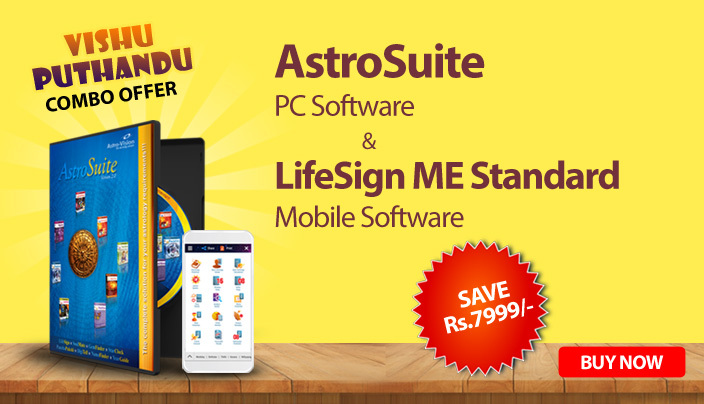 The reason for this confusion could be the fact that the Solar New Year coincided with Zodiac New Year about 1,654 years back when the celebration of Vishu is supposed to be originated. In actual, the festival Vishu doesn’t imply anything about Solar New Year. The Zodiac New Year stays constant forever while the Solar New Year changes at a rate of one degree in every 74 years. For people of Kerala, Vishu is a new beginning and is traditionally celebrated with colourful rituals and intense merriment. The farmers in Kerala begin their agricultural activities at this time of the year. Though Chingam is the official Malayalam New Year, it has no astrological or astronomical significance. Vishu is also considered as a festival of hope and prosperity and is celebrated with much fanfare and vigour in all parts of Kerala. 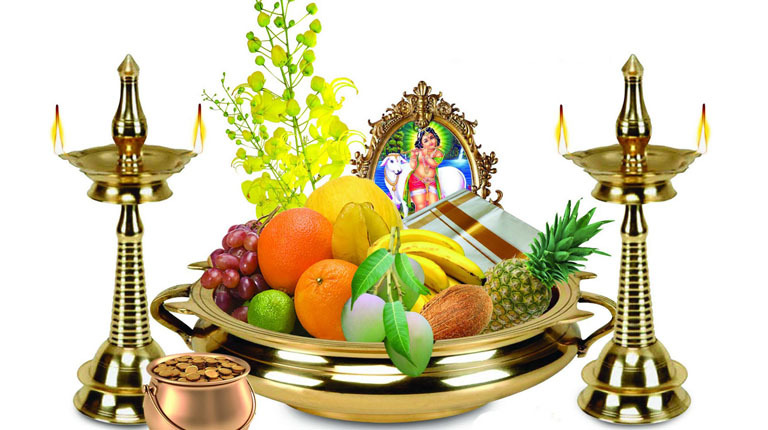 The celebration of Vishu involves various customs and rituals having social, cultural and religious significances. The traditions followed on Vishu are pleasing to heart as well as senses. People may buy new clothes for celebrating the occasion and visit temples in the early hours of the day. The major events of the day are Vishukkani, Vishukkaineetam and Sadya (traditional Kerala feast). The huge influx of devotees is observed in major temples in Kerala viz. Guruvayoor Sree Krishna temple and Sabarimala Ayyappa temple for viewing the Vishukkani. Apart from these, people celebrate the day by decorating homes with lights and bursting firecrackers (Vishupadakkam). 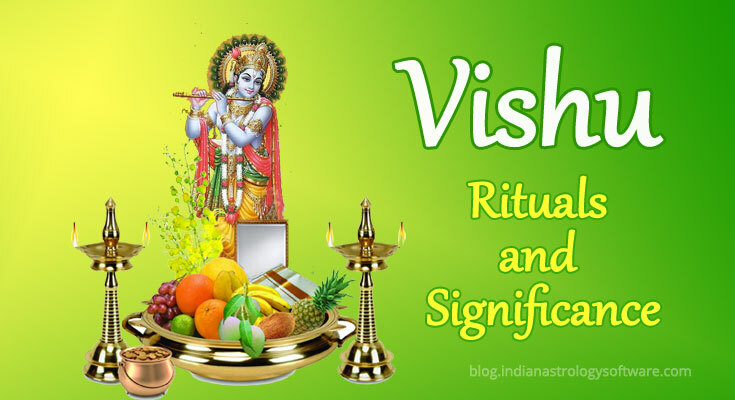 The most important event in Vishu is arranging and seeing Vishukkani. The Malayalam word ‘Kani’ means ‘that which is seen first’, and ‘Vishukkani’ means ‘that which is seen first on the day of Vishu after waking up’. The arrangement of Vishukkani is done at the night before Vishu in the family puja room. It is an array of auspicious articles signifying prosperity viz. a bunch of Konna flowers, an image or idol of Lord Vishnu/Krishna, nilavilaku (lamp), rice, fruits, vegetables, betel leaves, areca nut, coconut, mirror, gold, kasavu mundu, holy text and coins. The custom is that at Vishu pulari (the dawn of Vishu day) all members of the family should wake up early and go to the puja room with the eyes closed so that the first thing they see is the glorious sight Vishukkani. This ritual is called Kanikaanal. According to belief, one should see Vishukkani as the first sight of the New Year to make it a prosperous and peaceful year. Kanikonna is the Malayalam name of the tree Cassia fistula which produces bright yellow blossoms. Its flowers called Konnapoovu is the basic item required for Vishukkani and the tree will be in full bloom in the month of April when the sun is in its most exalted position. People may even set Vishukkani with a bunch of Konna flowers and an image of God when they find it hard to get other items. Vishukkani – the panorama of auspicious items is arranged in the previous evening with great care. Usually, the lady of the house takes the responsibility of setting this. The collection of auspicious items is usually arranged in an uruli (a circular vessel usually made of panchaloha – five metals). The golden yellow flowers of Kanikkonna symbolize affluence. Vegetables and fruits are set which implies the rich vegetation and farming. Cucumber, tender mango, jackfruit and banana are the usual items in the display, though people also use pineapple, grapes, cashew fruits and other vegetables. Betel leaves and areca nut, rice, coconut, mirror, gold, kasavu mundu, coins and holy text (Ramayana or Bhagavatgita) are the other items commonly used, and all are placed before an idol or image of Lord Krishna or Vishnu. Nilavilaku – the metal lamp with wicks made of starched cloth pieces soaked in oil, is also placed alongside. Akshatam – the mixture of rice and turmeric taken in an uruli or brass plate is part of Vishukkani arrangement. The rice taken may contain equal halves of husked and un-husked grains. Valkkannadi – a special mirror with a golden frame and the long handle is also placed. Those who don’t have Valkkannadi, use an ordinary mirror instead. Brass kindi – a spouted puja vessel used for pouring sacred water is also used. Traditionally, the urulis used are made of Panchaloham – an aggregate of five metals. Panchaloham is a symbolic of the universe made of Panchabhutas or five great elements viz. earth, water, fire, air and space. The lighting of deepam or nilavilakku in Vishupulari (dawn of Vishu) is done at the auspicious hour of Brahma Muhurtha (4am to 6am). The deepam is also a symbol of spiritual knowledge. The golden yellow Kanikonna flowers, ripened fruits and vegetables, akshatam, panchaloha and shiny brass of kindi give Vishukkani a golden hue in the glare of nilavilaku and its mirror reflection. The coins symbolize monetary as well as cultural and spiritual affluence, and Kanikkonna flowers associated with Lord Krishna represents the sun or eyes of Vishnu. Usually, the lady of the house lights the lamp takes in the auspicious sight of Vishukkani and wakes up other members who would come to the puja room with their eyes closed to see the auspicious Vishukkani as the first sight of the year. Vishukkani is not just reserved for those who come to the puja room but is taken around for the elderly and sick unable to come to the shrine. It is also brought outside to the cowshed and by doing so it is kept on display for the whole nature. 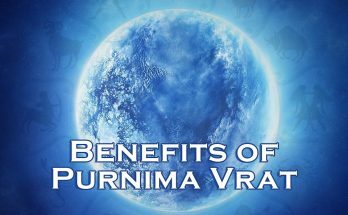 Reading verses from Ramayana or Bhagavat Gita on Vishu pulari is considered auspices. 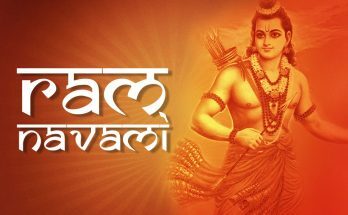 It is believed that the page of Ramayana which is opened up will have some significance in the coming year. 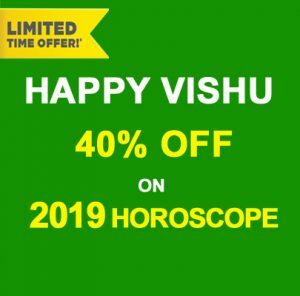 Vishnu who is the preserver of creation is also related to Kaala Purusha or God of time in Jyotishastra, which makes the beginning of zodiac year a right time to adore the Lord. Another important custom of Vishu is Vishukkaineetam. It is traditionally followed as the gifting of money by the elders to the younger generation or by the landlords to tenants. 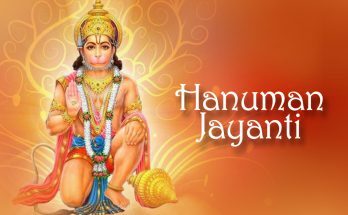 Usually, the head of the family gives vishukkaineetam to the younger generation, servants and other workers, and wishes them prosperity. Some affluent families not only give money to their children and workers, but also to their neighbours and natives. Vishukkaineetam should be given freely and it should be accepted with reverence. The Vishu feast or Sadya consists of equal proportions of salty, sweet, sour and bitter items. 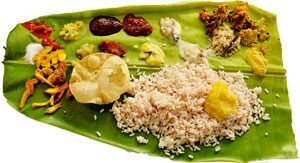 Though Sadya or traditional feast is a part of all Kerala festivals, there are some mandatory items for the Vishu Sadya. Vishu Kanji, Vishu Katta, Veppampoorasam (a bitter preparation of neem), Mampazhappulissery (a sour mango soup) and Thoran (a traditional side dish made of chopped vegetables and grated coconut) are the important preparations for the occasion of Vishu. Vishu Kanji is a preparation made of rice, coconut milk and spices and Vishu Katta is a delicacy prepared from freshly harvested rice powder, coconut milk and jaggery. The Indian culture stresses the importance of proper beginning of events and activities. It is believed that a good start is essential as the beginning lays the foundation to the rest. We also consider the position of stars and planets to ensure a perfect beginning. The elegance and splendour of Vishukkani point to a year of affluence not just materially but also spiritually. Its grace, just as creating a visual treat, should also reflect in our minds. Taking in the aura of Vishukkani we should pray that the profusion should remain with us in our thoughts and actions throughout the year. Food, light, money and knowledge should fill everyone’s life. 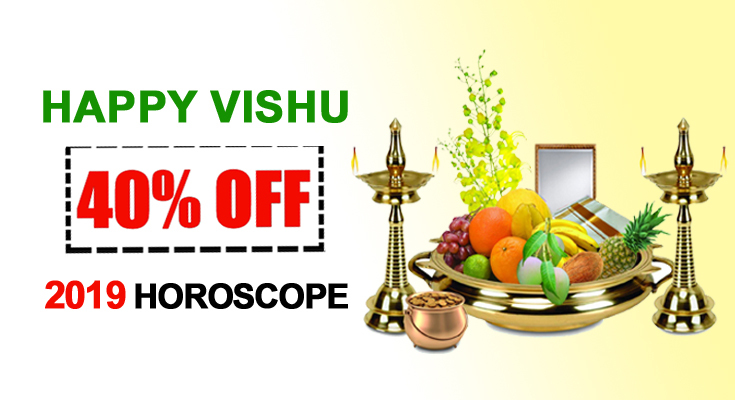 In Kerala, Vishu is celebrated when Sun enters Aries and transit through Ashwini commencing the Zodiac New Year. By opening eyes in the dawn of New Year, one is overwhelmed with the glorious sight of Vishukkani. The mirror which is symbolic of Bhagavati (Devi) increases the lustre of Vishukkani with the reflection it offers and shows our own face reminding the fact that God is within our-self. It also points to the importance of making our mind pure. The glory and affluence that may befall in our life is the result of our own thoughts and actions. Just as Vishu in Kerala, there are other festivals sharing the same spirit on other parts of India. Celebrated around the same time of year, these festivals mark the new beginning in the locally followed calendars. Ugadhi in Andhra Pradesh and Karnataka, Gudi Padwa in Maharashtra, Bihu in Assam, Baisakhi in Punjab and Pohela Boishakh in Bengal are different celebrations with almost the same significances.